If you’ve never preserved your garden abundance by canning, the system can be a little confusing. Here’s what you need to know about canning equipment and canning methods, from the right canning pot to the ever-popular Mason canning jar. A friend of mine—one who’s never canned before—asked me about home preservation. 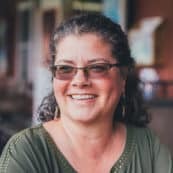 Her questions reminded me that although I grew up understanding the process of home canning and the necessary canning equipment, many people just don’t. Food preservation is the process of extending the life of perishable foods like produce and meat. There are a number of ways to preserve foods, including dehydration, fermentation, and freezing. 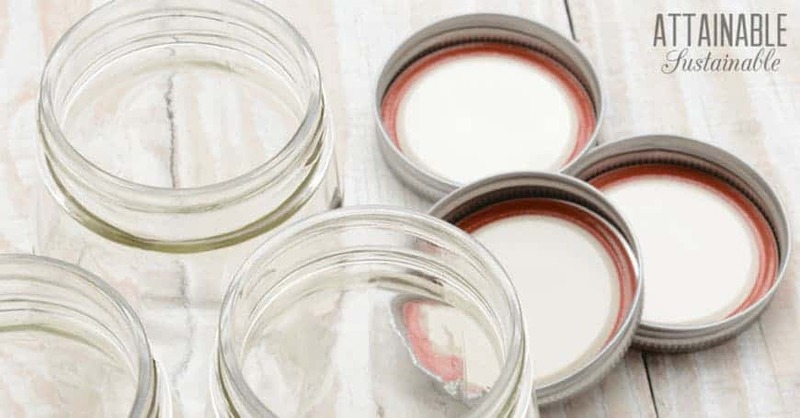 Here, let’s talk about canning food — processing food in canning jars to create a long-term, shelf-stable method of storing otherwise perishable foods. 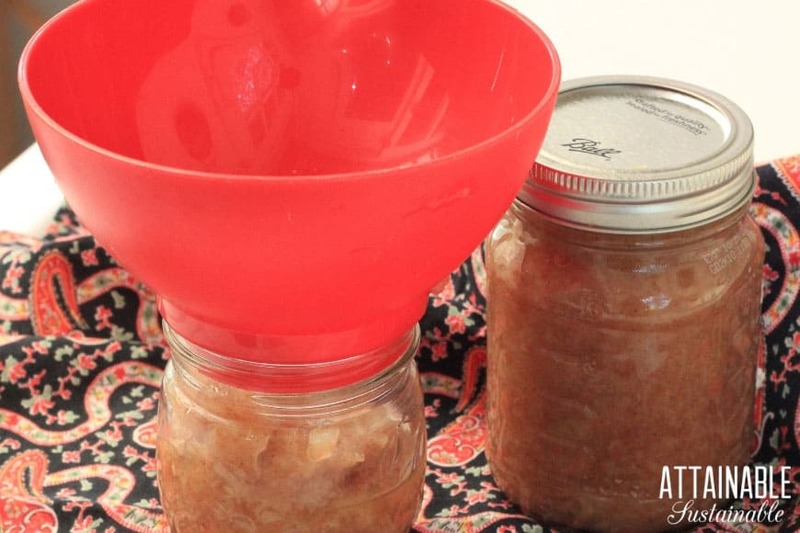 Home canning as a method of preservation is one that takes just a bit more effort than other home preservation methods. It requires some specific canning equipment (there’s no getting around it) and an understanding of the canning process. Canning food at home is not hard to do, but you will need to resign yourself to learning something new. The good news? As soon as you hear the first “ping” of a successfully sealed jar, you’ll be hooked. The basic canning equipment required includes the canning jar in which your food will be stored and the canning pot in which you’ll process the jars. Each of these come in a variety of shapes and sizes, and some are used for specific reasons. Let me lay out below the basic canning equipment you’ll need to be familiar with before you make your first batch of jam or jelly. The canning jars most commonly used for home preservation these days come from Ball and Kerr (both made by Jarden Corporation). They are glass and come in a variety of sizes, from small four-ounce jelly jars to half-gallon sized. You might hear a canning jar referred to as a Mason jar, after a vintage brand. All of these jars are approved for home canning use except for the half-gallon size (I use the half-gallon size for storing dry goods). The small sizes are good for jams and jellies, especially those that you plan to give as gifts. Canning jars come in both a standard or wide mouth, referring to the size of the jar’s opening. Wide mouth jars are useful for preserving larger items like peach halves or for pickles that need to be placed in the jar by hand. Canning lids are typically metal, a flat disk with a ring of rubber around the perimeter. They’re also called “flats.” This rubber ring allows the food to remain sealed inside the jars after processing. Lids come in both standard and wide mouth sizes to correspond with the jars. Jarden rolled out BPA-free lids in early 2013. You must purchase new lids for each new canning project. Lids are sold in sets of twelve and can be purchased separately from jars and rings. An alternative to metal canning lids are the plastic lids made by Tattler. These come in two pieces — a plastic disk and a rubber ring. Tattler canning jars are BPA-free and can be reused from year to year. Metal rings (also called bands) also come in both standard and wide mouth sizes. These are screwed over the lid to hold the lid in place during the canning process. Once your jars have cooled and the lid is sealed, rings are removed for long-term storage and can be used to process another batch of jars. This means that you don’t need as many rings as you have canning jars. Rings can be reused indefinitely, but they do tend to rust over time. The jars from Weck are in a category of their own. Both the jars and lids are made from glass, and thus reusable. The sealing ring is rubber and also reusable. The sealing process with a Weck jar requires a couple of metal clips that hold the rubber ring and glass lid in place during processing. 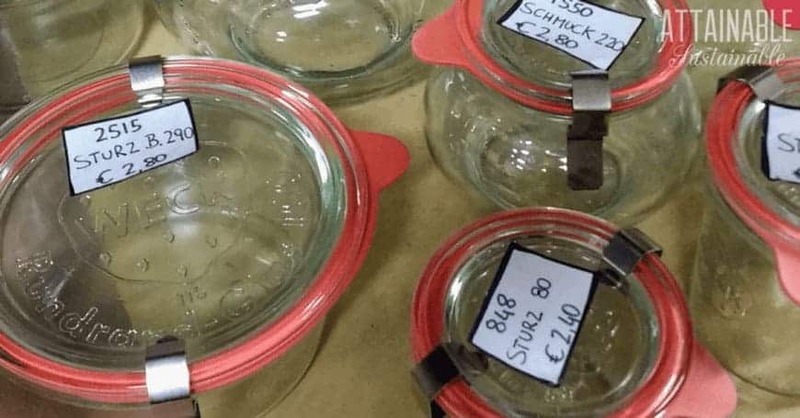 Weck is a European company and while the jars are available online, you won’t find them as readily available in the USA. With an understanding of canning jars and how they work, let’s talk about filling those jars. Many recipes use a “hot process,” meaning that the recipe is heated to boiling and then transferred to to jars. Some specialized canning equipment can help make this job easier. Trying to pour hot salsa or jelly into a jar without spilling it all is not fun. A canning funnel eliminates this problem. Made to fit both wide and regular mouth jars, a canning funnel makes it easy to transfer hot ingredients to jars. A kitchen ladle can work for canning as well, but some canners (including myself) prefer a larger-capacity option. Canning ladles generally have longer handles, too, so you won’t accidentally lose your ladle in a big batch of applesauce! Once your jars are filled and sealed, you’ll need to transfer them to the hot canning pot. You’ll need a jar lifter, sometimes called jar tongs. This rubberized lifter allows you to hold jars securely as you lift them into and out of the canner. What kind of canner — and canning method — you use depends on what you’re processing. Fruit, pickles, and other high-acid foods can be processed in a water bath canner or a steam canner. Low acid foods like vegetables and meat must be processed in a pressure canner. As you might imagine, a water bath canner is one that is filled with water. This canning method requires that filled and sealed jars are submerged in water and processed in boiling water. A water bath canning pot usually comes with a wire rack that holds the jars in place and prevents them from sitting directly on the bottom of the canner. A deep stock pot is something most kitchens are already equipped with and can stand in for a water bath canning pot in a pinch. You just need to be certain that the jars are completely surrounded and covered by one-to-two inches of water. Use a wire cooling rack on the bottom or — in a pinch — tie several canning bands together and use them as a rack. This prevents the jars from rattling together. 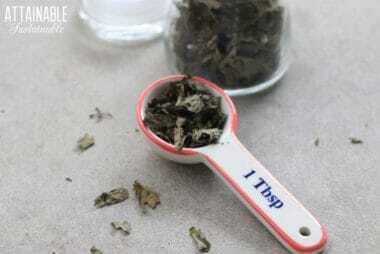 The steam canning method can be used much like a water bath canning pot. Recently approved for home canning, steam canners use substantially less water than a water bath canner and heat up much more quickly. These canners have a shallow base that is filled with water. Jars sit on a rack above the water and a deep lid sits in place above them, retaining the hot steam. Check these guidelines for safe canning in a steam canner. With Instant Pot electric pressure cookers being so popular, the first thing I must point out is that much as I love mine for cooking, they are not suitable for canning food. A pressure canner is large, deep canning pot with a lock-on lid and a pressure gauge. It’s one of the most daunting pieces of canning equipment for many people. Like water bath canning, this canning method requires heating jars full of ingredients in water. The difference is that the canner is sealed and heated to build up pressure. 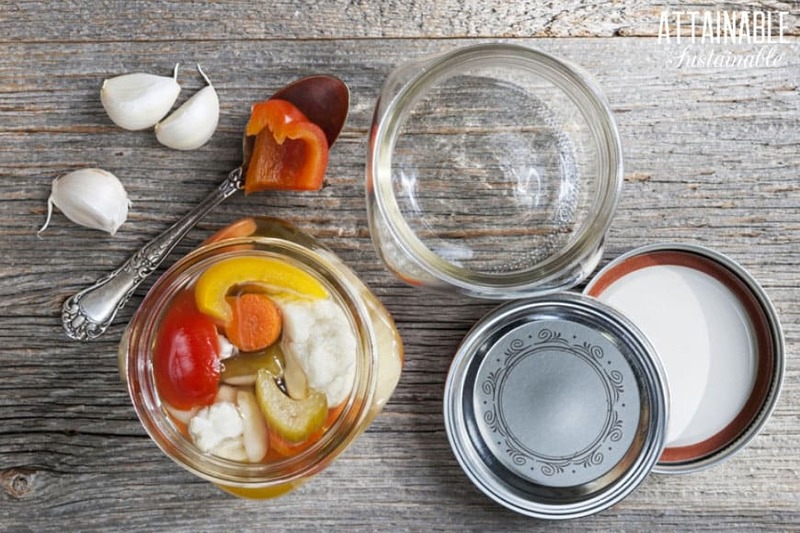 Pressure canning is the only safe way to can vegetables, meats, and other low-acid foods. 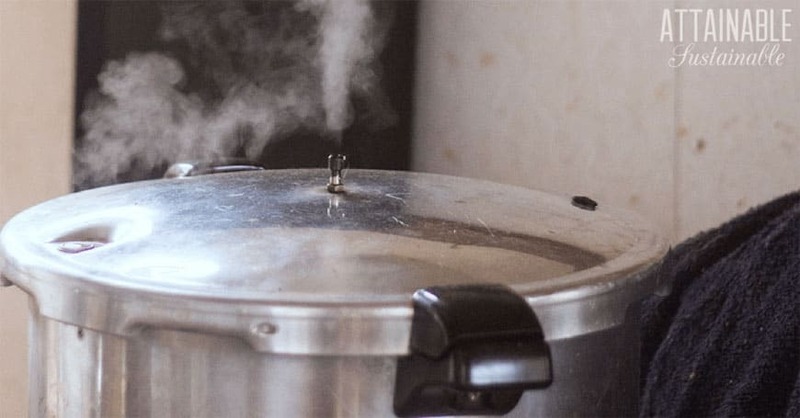 Pressure canning essentially creates superheated water, with temperatures reaching substantially higher than the 212 degrees Fahrenheit achieved by simply boiling water. See these 15 tips for ensuring success with your pressure canner. Next Post: Making Gravy from Scratch – It’s Easy to Make at Home and Tastier, Too! This was interesting. I’m a novice but realize I have to learn. Why, oh why, is there BPA on the lids? Why, indeed! I suppose because nobody thought about the health ramifications when BPA first started being used. And now it’s in everything. Impressive – you really know your jars! I don’t do any canning, but have always admired the styles of these jars, nonetheless. Sheryl, I love the way the jars look, too. But stick around. You might become a convert to canning! I remember my mom used Weck-style jars back in the “old country”. Putting the metal clips on the lids seemed difficult to me even when I tried that with cold jars. But the nice thing was that the lids and all were reusable year after year. We did have to buy the rubber rings once in a while to replace the dried out or damaged ones. Here in the States I use Ball jars – good results and very easy to use although I feel bad about throwing away the metal lids. I do use the “spent” lids to store dry food in Mason jars, so I rarely throw them away. But I wish I could reuse them for processing! I’ve only attempted things like jams and jellies, and it was a boatload of work, especially the year I decided homemade orange marmalade was a good gift idea. Scraping the peels took forever. Yep, it’s almost that time of year again. I canned for the first time last year and looking forward to this year! How I wish I would have listened more when my mom was canning. This post is helping educate me–if only I’d offered to take her canning jars when she was giving them away! Start letting people know. In all my years of canning, I’ve only purchased a couple of cases brand new, thanks to neighbors and friends who passed theirs along, or told someone else that I’d take their jars! Growing up on a farm, my mom canned everything. I’m mostly familiar with Ball jars, but those Weck jars are so pretty. I love the Ball jars, too, though. They’re so old fashioned and comfortable! I love those Weck jars too, but (like you) I can’t justify buying them when there are truly dozens of Ball jars all around my house. Gotta be frugal around these parts! I think I’ve reused metal lids before, for homemade yogurt. Oops! I have yet to really can though we have a million of these jars and we use them for leftovers and freezing berries and freezer jam, etc. Anyone planning to do home canning should use only those recipes thoroughly tested. Extension is the mmost reliable source of all things canning. University of Georgia Extension is the national clearing house for research and resources. 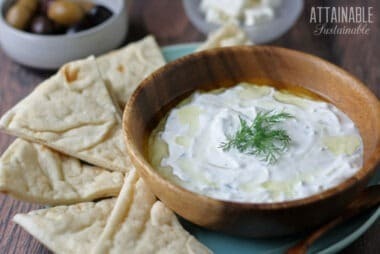 Check out their website at Homefoodpreservation.com – you will be redirected to a uga site. they have recipes, instructions, videos, FAQs and more. Don’t rely on information published before 1988 and don’t use recipes from cook books – except those published by major canning equipment companies – like Ball, Kerr, and Presto. Just found your site today. I’ll be following you for sure! Thanks for the great info. Can you reuse lids for things that you aren’t canning? Last year I made pickled peppers but we ate them within the month so we weren’t storing them unrefrigerated. I also make elderberry syrup frequently and reuse jars. I’m new to all this so any advice would be helpful. 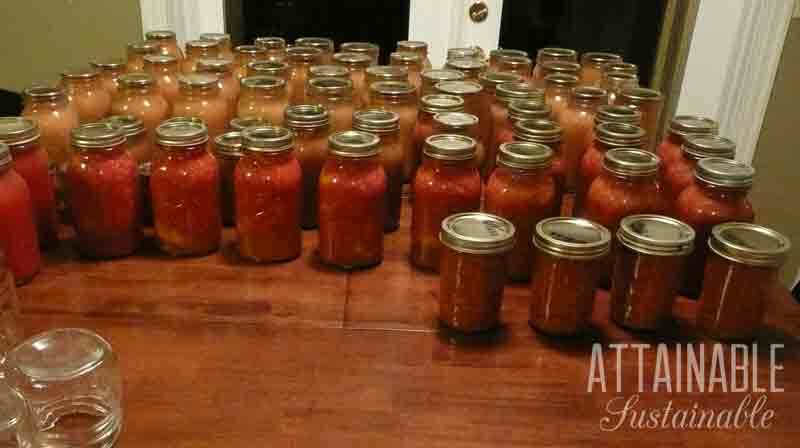 Canning is still a ways down the road but something I’d eventually like to do. Oh, you can use the flat lids for storing dry goods and as someone else mentioned, with one of those food saver things. You just can count on them for a safe seal when you’re *canning foods for long term, shelf stable storage. I have a question. I bought some jars, and the lid were on the with the rings so tightened with the rubber side to the glass. They are not totally sealed ut kind of. Is it ok to use the lids or should I get new? I’ve had that happen and have used them. My rationale is that they were not on tight enough to really compromise the rubber seal.